The Alcatel One Touch Scribe HD is one of the many Android smartphones the company has on display here at MWC 2013. Think of it as a relatively affordable alternative to the Samsung Galaxy Note II, given the fact that Alcatel's phablet also comes with a spacious display and a stylus thrown in the box. However, there are a few trade-offs that must be noted. To start, the Alcatel One Touch Scribe HD has a 1.2GHz quad-core processor made by MediaTek, while the Samsung Galaxy Note II is equipped with a 1.6GHz Exynos chip. While chances are that the real-life performance of the former won't disappoint, we're pretty sure that the latter packs the stronger punch. Also, while both smartphones come with 720p displays, the one on the Galaxy Note II offers slightly more real estate being of 5.5-inches in diagonal versus the 5 inches offered by the One Touch Scribe HD. 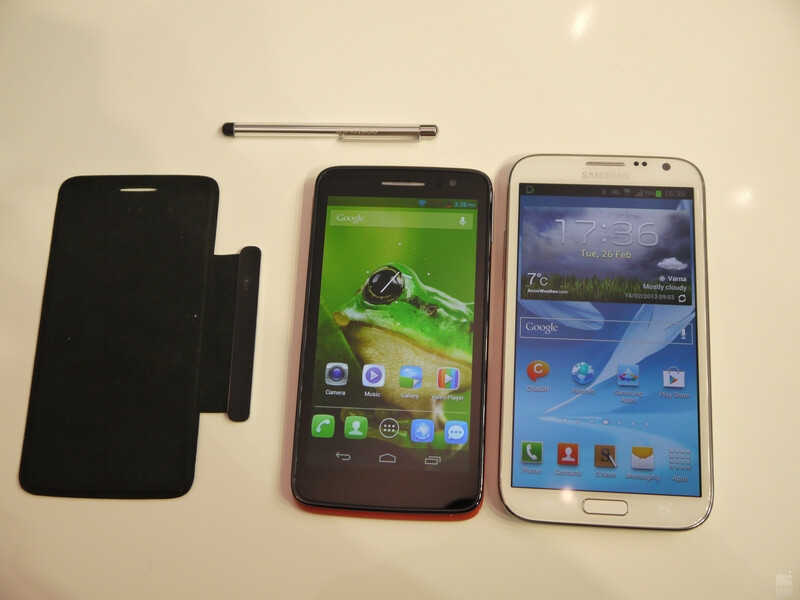 Designwise, both the Alcatel One Touch Scribe HD and the Samsung Galaxy Note II fit in the same category. On the outside, both are made out of plastic with glossy finish. In addition, both devices come in multiple colors, although we must note that the color hues chosen by Alcatel are brighter, suitable for the younger crowd. The stylus that the Alcatel One Touch Scribe HD comes with out of the box is pretty generic so it should work with all capacitive touch screens. It is a bit frustrating that one has to carry it in their pocket unlike just sliding it inside a dedicated slot like the case is with the Samsung Galaxy Note II. Alcatel will ship the One Touch Scribe HD with a protective flip screen cover out of the box. It is detachable and sticks to the device with the help of magnets. The accessory looks far from fancy, but we appreciate the fact that it comes included in the set. I don't understand why a phone that incorporates a stylus as an integral part of its operation wouldn't include a place to hold it. Even old, tiny Windows Mobile devices had sheathes for styli. Also, in the second paragraph you used the word "latter" twice in the same sentence. I'm sure you meant "the real-life performance of the former won't disappoint." I agree. Same with the LG Vu/Intuition. I bet countless users have already lost them. I love my Note 2 because I can't walk 10 feet with my phone in hand without it telling me that I haven't replaced the stylus. The Galaxy note 2 in its own league in terms of productivity compared to any other phone/phablet at the moment. So right. I haven't seen another phablet even rival the Note 2. The contenders always come with some major flaw that always discounts them immediately: awkward design, weak specs, poor screen, etc. Most people don't use the stylus anymore after a few month buying note 2. Wrong. One of the reason why people buy the note 2 is because of the stylus and they love using the stylus. Do you even own one? Do you even know anyone that owns one? I use my stylus so much that I can't imagine going back to an Android that doesn't have one or has a smaller screen. I guess my next phone will have to be a Galaxy Note 3. I always love your passion & enthusiam, RIchard. I see so many of your posts here & on T-Mobile News. Keep it up. The haters don't matter. Alcatel is trying to manipulate consumers with the included stylus and name scribe into thinking they are getting the same features as found in the Note. The stylus is the same type that can be purchased for any phone or tablet and works no better than your finger whereas Samsungs Wacom stylus offers the precision necessary for handwriting, drawing, photoshop...etc. I'm sure Samsung had to pay quite a bit for including the Wacom pen tech and the only other products that come close would be N-Trig pen enabled. The only thing these phones have in common is size and a misleading similar name.